What would you guess was the purpose of the first ever commercial flight taken in England? Taking passengers from London to Edinburgh perhaps? Or maybe a sightseeing trip over tourist attractions? Instead, in a brilliantly British idiosyncratic moment, one William Barnard Rhodes-Moorhouse flew his new Bleriot aeroplane to Northampton, picked up a small consignment of shoes from Barratt’s and returned home. A fascinating photograph on offer at East Bristol Auctions Military, History & Transportation Sale on February 16 shows that very flight. 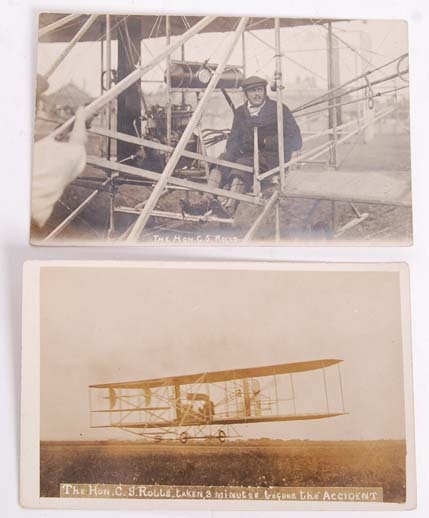 It is part of a small collection of early aviation photographs set to go under the hammer. The group – totalling just six images to be sold in three separate lots – shows early aircraft around the start of the century, mostly relating to Milton Keynes and surrounding areas. 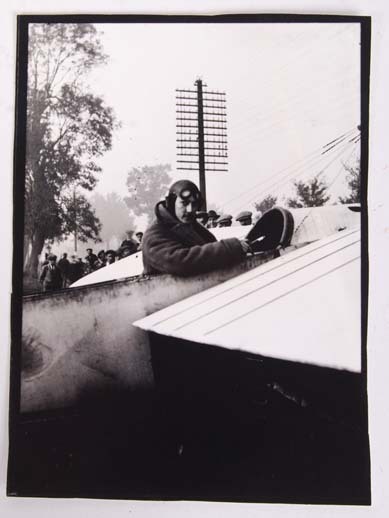 The image depicts Moorhouse looking back at the photographer while seated in his Bleriot aeroplane with an assembled crowd gathered behind. The lot is accompanied by some contact-prints taken of the negative in the mid 1970s by a family member. On a mission to bomb a railway line in on April 26, 1915, Moorhouse lowered his plane to get a good view of his target and was met with heavy fire from the ground. Severely injured, he then turned for home and was met with yet more gun fire, wounding him further. Limping over a hedge, he is said to have made a ‘perfect landing’ when returning to his comrades. His hand and stomach had both been blown away, but he insisted on filling out his report before he received medical attention. The intelligence he gathered was deemed highly valuable, and he was awarded the VC. Unfortunately, Moorhouse died within a few hours and his medal was given posthumously. Two other images contained within the group tell an entirely different tale of early aviation. 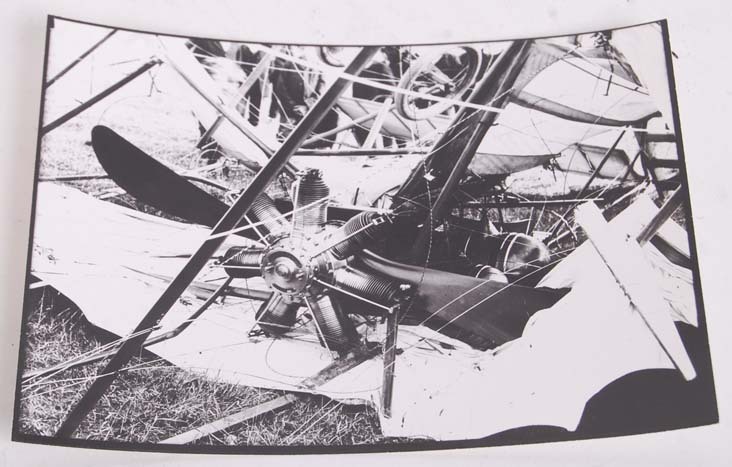 One of the Edwardian real photo postcards, marked ‘taken three minutes before the accident’, was later discovered to show the final moments of Charles Rolls (of Rolls Royce) before his fatal air crash after taking off from Hengistbury Airfield, Bournemouth, on the morning of July 12, 1910 – what is believed to be the first aeroplane-related death on record. The second picture shows a somewhat blurry image of Rolls taking off in the field. “It’s quite likely the last image taken of Rolls alive,” adds Stowe. 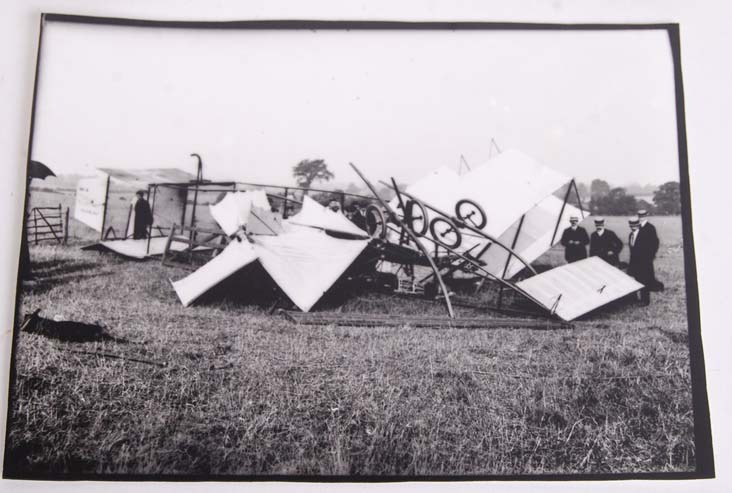 The final set of these photographs depicts biplane crashes in the Milton Keynes area in 1911. All these photographs belonged to Albert William Eley, Mayor of Milton Keynes in 1978, who had a keen interest in aviation history, particularly in the local area. Rhodes-Moorhouse's VC is on public display at the Imperial War Museum in London as part of Lord Ashcroft's medals gallery. Lord Ashcroft wrote of his bravery in a Telegraph article in 2013, saying: "I bought Rhodes-Moorhouse’s gallantry and service medals at Sotheby’s in 1990 and they are on display at the Imperial War Museum. Also on display is the pin from the vital 100lb bomb that Rhodes-Moorhouse dropped."